The first episode. The Player picks detectives to try to catch Carmen Sandiego. What's Carmen done now? She has stolen the eyes of a Vincent van Gogh self-portrait, the nose from a Picasso, and the Mona Lisa's smile. Carmen plans to create her own masterpiece. Acme detective Ivy and her younger brother Zack are the only ones who can stop her. I liked this episode even though it had some rough spots. It is the first episode. From the Chief's van Gogh lesson. At the Van Gogh Museum, the eyes from "Self-portrait, Saint-R�my" by Vincent Van Gogh stolen by Carmen Sandiego. The nose of Picasso's "Portrait de Jaime Sabart�s" is stolen from the Museo Picasso [crime not shown]. 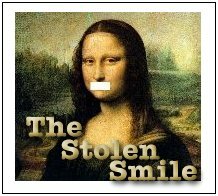 At the Louvre Museum, the mouth of the "Mona Lisa" by Leonardo da Vinci stolen by Touriste Classe and Carmen. At the Lascaux Cave, Carmen steals the tv airwaves from the world and broadcasts her message. Items recovered.